Sovaldi (sofosbuvir) is a novel nucleotide polymerase inhibitor class drug used in a combination antiviral therapy for the treatment of hepatitis C (HCV). Sovaldi works by blocking an enzyme that HCV uses to replicate its RNA, effectively interrupting a stage in the virus' lifecycle. 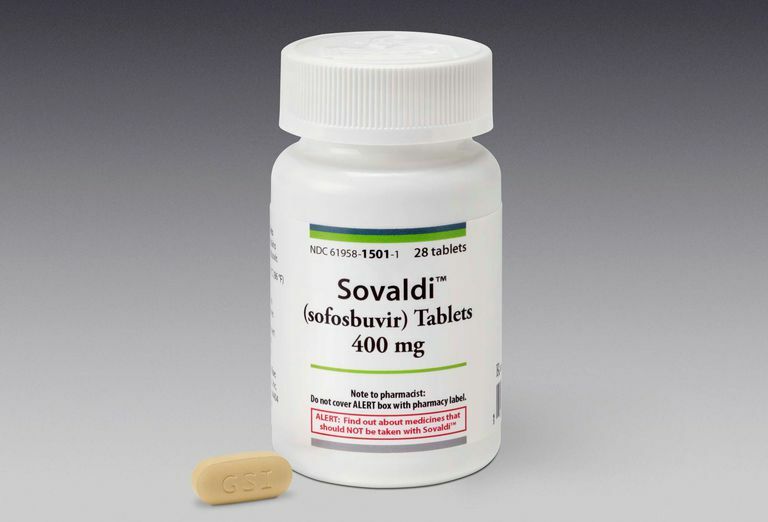 Sovaldi was approved in December 2013 by the U.S. Food and Drug Administration (FDA) for use in adults 18 years or over with HCV genotypes 1, 2, 3 and 4 infection, including those with hepatocellular carcinoma (the most common type of liver cancer) and for individuals with HIV/HCV co-infection. Sovaldi is approved for use in previously untreated (treatment-naïve) patients, as well as those with partial or no response to prior HCV therapy. Clinical research has indicated that the cure rate for treatment-naïve patients on a Sovaldi-based regimen is between 82% and 96%. One 400 mg tablet taken daily with or without food. Sovaldi tablets are yellow and film-coated, with "GSI" embossed on one side and "7977" on the other. Sovaldi is prescribed for use in combination therapy with ribavirin; with both pegylated interferon (peg-interferon) + ribavirin; or with Daklinza (daclatasvir). Sovaldi must never be used as monotherapy. Genotype 2: Sovaldi + ribavirin for 12 weeks. For patients with genotype 1 who are either ineligible for interferon or interferon-intolerant, it is recommended that a combination of Sovaldi + ribavirin be prescribed for 24 weeks. For any patient awaiting liver transplant, the above-listed therapies should be prescribed for either 48 weeks or until the transplant is performed, whichever comes first. With the exception of anemia and neutropenia, the majority of side effects associated with Sovaldi use are considered mild or transient (Grade 1). In clinical research, 1% or less of patients on Sovaldi + ribavirin terminated therapy prematurely due to intolerable side effects. The incidence increased to 11% for patients on Sovaldi + ribavirin + peg-interferon. For patients with HIV, Sovaldi should not be co-administered with either Aptivus (tipranavir) or Norvir (ritonavir) as these protease inhibitor class antiretrovirals may decrease the serum concentration of Sovaldi. Sovaldi is contraindicated for use during pregnancy or in men whose partners are pregnant as animal studies have suggested a potential risk for birth defects or fetal death. It is recommended that all women of child-bearing age be monitored monthly for pregnancy during the course of therapy. It is also recommended that the patient and her male partner be provided at least two non-hormonal methods of contraception and that they are used during the course of therapy and for six months afterward. Manns, M. and Cornberg, M. "Sofosbuvir: the final nail in the coffin for hepatitis C?" Lancet. March 15, 2013; 13(5):378-379.